Book Review: The most important books of the decade? 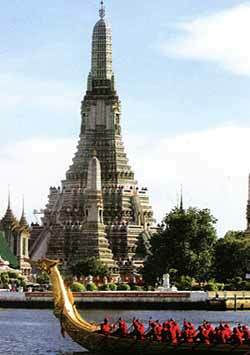 IWe have just had the celebrations to mark the ascension of the King of Thailand to the throne 60 years ago. This made King Bhumibol Adulyadej the Great, the world’s longest serving monarch, and as such merited all the congratulations he received from world leaders. However, there was more than that. Personally I know of no other monarch who has worked so tirelessly for his people as the King of Thailand, and what is more, that labor was one that he accepted with grace and humility, making him a role model not just for Thais, but for everyone, including other royal families in the world. It was indeed heartening that 25 other royal families came to acknowledge that fact. 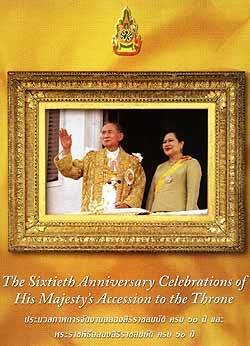 Both The Nation newspaper and the Bangkok Post have now published pictorial essays in book form of the celebrations. I have no need to say that these have been pitted against each other, as they are really complementary. Amongst the formally posed photographs there are some wonderful candids, especially the ones of Princess Maha Chakri Sirindhorn with her own camera peeping around her father on the balcony to take some shots for her own personal family album. 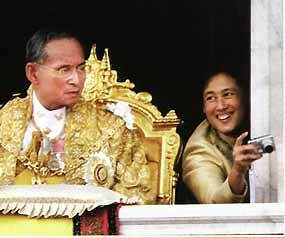 A wonderfully human vignette, allowing us a glimpse of the ‘real’ person behind the royal trappings. A 60th royal anniversary will most likely never again be seen in any of our lifetimes, so it was a particularly significant occasion, and one that we have been privileged to watch. The barge processions on the river were just breathtaking in their beauty. We should try and impart that significance to our children, and these books will allow us to do that. The RRP for The Nation’s publication was B. 90 and the Bangkok Post’s was B. 99. A very inexpensive investment for the future. Despite the words being in Thai (plus some English translations), I have purchased both books for my friends and family. Photographs can be understood by all nationalities! As Ian Hunter surges into the second half of his seventh decade, he leaves many of the young pretenders in his wake. His live shows still are full of energy, superb songs, great showmanship, and surprises. His story is one of the more vivid and real of all the rock ‘n’ roll stories. Many peaks and troughs, but never ever counted out. In 1969 Ian Hunter had a past record as a rocker playing mainly as a bass guitarist with people like Freddie ‘Fingers’ Lee, touring Hamburg, but never really making an impression, and had been reduced to working as a Tin Pan Alley song writer, with only moderate success. But fate was waiting just around the corner. A group of people including such firebrands as Chris Blackwell, David Betteridge, and Guy Stevens, had set up Island Records. Guy Stevens had just signed up and taken under his wing a band called ‘Silence’. As ever, Guy Stevens was full of enthusiasm, but knew there was a missing component in the band. So Stan Tippins, who at the time was singing for the band, was shuffled across to be road manager, and auditions were set up looking for a new focal point within the band. A friend persuaded Ian Hunter to try out, and on a whim Hunter followed his friend’s advice and went down to the studio where the band was rehearsing. At thirty years old, extremely shy, rather fat, and with unfashionable short curly ginger hair, the prospects were not exactly good. When Ian Hunter arrived, Guy Stevens asked him what he could do, and Ian Hunter sat down at the piano and jammed his way through, ‘Like a Rolling Stone’, the old Bob Dylan standard, and then ‘Laugh At Me’ by Sonny Bono. Ian Hunter is not a natural singer, nor did he have the stage presence that now dominates his live performances. But Guy Stevens could see something, and somehow managed to persuade the other four of ‘Silence’ to take the podgy guy hiding behind his shades into the band. A name change for the band was deemed necessary and Guy Stevens came up with ‘Mott The Hoople’ from the title of the Willard Manus novel. After three years and four albums, Mott The Hoople could fill almost any concert hall in the world, had toured the States almost every six months, but could not sell an album, and after a bad gig in Switzerland they decided to call it a day. A great live band, but the albums were weak, not always the band’s fault as production often let them down, massacring great songs like ‘Sweet Angeline’ from Brain Capers (1971), making them sound weak when they could turn them into raging missiles in the live arena. Once home, Overend Watts rang up David Bowie, who at the time was just taking off on the crest of his wave to the top of the rock ‘n’ roll tree, to ask if he had any work for an unemployed bass player. Bowie was horrified to hear ‘Mott The Hoople’ was splitting up, revealing himself to be a huge fan. Bowie persuaded the whole band to come around and see him. After a meeting, Bowie offered the band new management, a new record label (they moved to CBS) and most importantly a song. The first song that was offered was ‘Suffragette City’, but the boys hung out for another little song Bowie had called ‘All The Young Dudes’. Mick Ralphs added the guitar introduction and Ian Hunter added the rap at the end, and bingo, Mott The Hoople had a huge hit on their hands. 1974 was the year of Mott The Hoople: A week of sold out shows at the Uris theatre on Broadway, touring America and the British Isles twice with Queen as support, the world was in the palm of their sweaty little hands. Ariel Bender was then pushed out of the band, and replaced by David Bowie’s old guitar player Mick Ronson, and Mott The Hoople was destined for the stars. Instead of which, Ian Hunter collapsed with exhaustion, and the band imploded, with Hunter and Ronson going off to form a new band. Since then Ian Hunter has followed his own path, releasing nine solo albums since 1975. 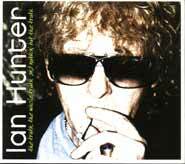 This double live CD gives all of Ian Hunter’s two and a half hour show at the Astoria Theatre, London. All the hits are here, mixing songs from Mott The Hoople’s debut album to Ian Hunter’s latest solo recording ‘Rant’ (2001). The band is as tight as any band in the world, firing off each other with the two old boys Hunter and Ralphs having the time of their lives. The title track is as good as any rock ‘n’ roll gets with the guitarists firing sparks at each other whilst Ian Gibbons, on keyboards, Gus Goad on bass and the superb drumming of Steve Holley nail the music to the floor, whilst the man himself leads from the centre of the stage. To bring the whole thing to a blistering close, Brian May of Queen steps out from the sidelines to throw some guitar shapes all over ‘All The Way From Memphis’. It is a great tribute to Ian Hunter that after twenty one songs, including a medley of old Mott The Hoople favourites, there are still plenty of songs that you wish could somehow have been shoe horned into the set, like ‘The Golden Age Of Rock ‘n’ Roll’, ‘Good Samaritan’, ‘All of the Good Ones Are Taken’, ‘Violence’, ‘Sweet Angeline’, ‘The Outsider’, ‘One Of The Boys’; the list is endless. Maybe next time. Only a four star rating though, as the packaging is awful. In this day and age of downloading etc, you need to encourage people to buy the product, therefore the packaging should be attractive to encourage the buyer. But the music is great.